“THE CHANGING WORLD OF BOATS"
Boat sales are steady but some sizes have surged way ahead. Among those rapidly advancing are the mega yachts, 50 to 60 feet and up. At the spring Miami in-water brokerage show last year, which numbered well over 100 craft, you could find boats priced from $ 750,000 on up to 6 or 7 million. Sales of just two of the high priced mega yachts could equal double the business of the prior year for some manufacturers. This increase is notable but the impact on the industry as a whole is negligible because few of us can afford the luxury vessels. Most of us can only gaze in awe as I did at the show. At the other end of the sales spectrum are the very small boats. Many of them are not even considered boats but are thought of as “toys.” I’m referring to canoes, kayaks and paddleboats as well as rubber inflatables. These are boats and they are becoming very popular in today’s boating marketplace. I am fortunate to spend my winter months in the Florida Keys. Seldom does a day pass that I do not see a group of kayaks or canoeist. I also encounter small inflatables on the waterways. 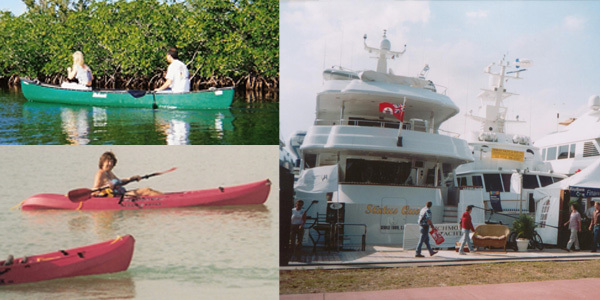 During the past few years, the number of small boats seems to be growing rapidly in the south. I do my boating on Lake Huron in the summer months and also encounter the small vessels on that body of water. They are showing up everywhere, I’ve even seen them many miles offshore. I once met a small group of paddlers entering my home harbor that had paddled all the way across Saginaw Bay a 29 mile passage. Although I would not advise this adventure nor would I ever do it myself, I am becoming accustomed to seeing them. They are now referred to as Paddlesport or Paddleboat enthusiasts and are on most waterways of the country. The paddlesport activity has become so popular the Coast Guard started a new initiative, “You’re in Command. - Boat Responsibly.” To kick off a national public service campaign they selected Silver Medallist, Rebecca Giddens and the American Canoe Association. They joined in a nationwide campaign to unify efforts and focus on saving lives of paddlesport enthusiast and promote paddlesport safety. If your vessel is 10 feet long and 2 feet wide and you encounter a vessel 40 feet long and 16 feet wide, you need to know how to handle your craft ahead of time. The wake of a large boat can present the need for quick maneuvering in a paddleboat. Keep in mind, many paddlesport enthusiasts will find themselves sharing the waterways with powerboats and jet skis so they must be prepared to react quickly and defensively. It would be great if other boat operators would reduce the speed and wake of their vessel when encountering paddleboaters but there will always be those that just don’t care. With the big increase in the paddleboat sport I anticipate a problem of the small boats capsizing and perhaps the operators drowning because of big boat wakes. Will the rule of the road; “You’re responsible for your wake” apply? Some boaters actually enjoy upsetting the small boat operators and watching them as they attempt to stay upright. This is not unlike drivers of cars on the highway that try to give motorcycle drivers a scare. It’s hard to believe but there are people out there like those I described ­ I know because I have seen them. The bottom line in the Coast Guard Initiative seems to be, try to locate and attend a safety course for paddlesports. They are also promoting lifejacket use by paddlers. I too believe they should all wear lifejackets.. I know they are clumsy and cumbersome and trying to paddle while wearing one is difficult. Some kayaks barely have room to squeeze the paddler in without extra outerwear. Wearing a lifejacket will save your life ­ it’s just that simple. Try to find one that will keep you safe and still allow freedom of movement. They are available you just have to shop around for them. Will the Coast Guard promote a mandatory lifejacket law for paddlecraft? The answer to that question is not yet known. Do those in paddlecraft need to have a lifejacket aboard? The answer to that question is yes, just the same as all other boats. The federal requirement of those 13 and under wearing a lifejacket while aboard applies unless a state requirement provides otherwise.